The Law of Empowerment states that secure leaders give power to others. There’s a real tendency in modern business culture to use your managers or create a sense of competition to drive productivity, but manufacturing feelings of insecurity and inferiority will only encourage your employees to leave. The Law of Empowerment requires us to approach leadership from a different angle. In his chapter on the Law of Empowerment, John Maxwell writes, “To lead others well, we must help them to reach their potential.” Only empowered people can reach their full potential, and when leaders don’t empower their employees, they create barriers to their own company’s success. Maxwell tells the story of Henry Ford, who pitted his top leaders against each other and micromanaged every aspect of the Ford Motor Company. Unsurprisingly, his senior executives left one by one. Hiring quality workers is expensive and time-consuming—it’s better for everyone to create a nurturing environment that employees can thrive in long-term. This means empowering your workers by giving them authority over their projects, helping them reach their own career goals, and giving them all the resources, time, and understanding they need to succeed. 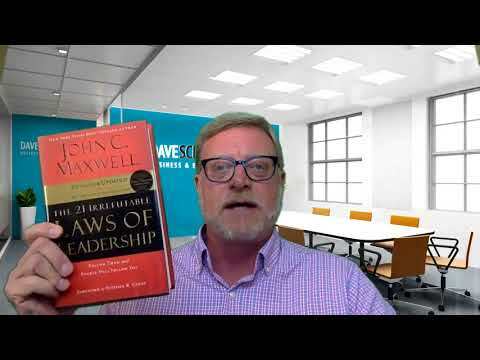 However, as Maxwell writes, there are three main reasons that employers don’t empower their employees: a fear that creating strong leaders will render them dispensable, a resistance to change, and a lack of self-worth. These barriers can be overcome through self-reflection. First, examine your self-worth. Do you believe that you have value, or do you feel insecure? Does the idea of working alongside talented leaders make you feel threatened? Be honest about these feelings. If needed, take the time to develop your self-worth before moving on. Next, consider how you feel about your employees. Do you believe in them? If not, why did you hire them to begin with? Rate each employee’s potential from 1 to 10. You want employees that have a willingness to learn and grow, along with the motivation to better themselves. If your employees’ potential, on the whole, is low, remember the Law of Magnetism: who you are is what you attract. Ask yourself if you might be part of the problem. You might need to invest in your personal development to attract high-potential employees. The Law of Empowerment requires you to see the good in other people. Dwell on their positive characteristics and encourage their career goals. Give your people the resources they need to succeed and help them through their failures. If you believe in others, they will believe in themselves. The Law of Empowerment is key to nurturing good leaders and helping your organization grow. If you need some ideas about putting this to work for your business, fill out my contact form and let’s talk about putting the Law of Empowerment to work for you.